Signed Mixed Media Painting of Rio de Janeiro Icons, "Carioca Magic"
The Arches of Lapa and dancers in their shadow, coconut palms, a hang glider and the face of Christ the Redeemer — icons of Rio de Janeiro — emerge from a composition of sunny color. The Botanical Garden and distinctive wave motifs on the Copacabana beach walk complete this vibrant portrait of the city. Claudia Thomaz paints a nostalgic medley of Rio de Janeiro icons. Titled "Magia carioca" in Portuguese. 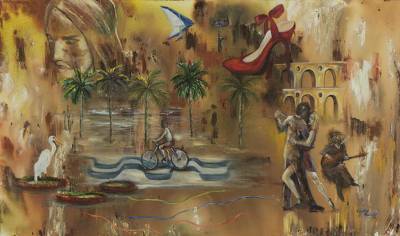 You can find 'carioca Magic' by Claudia Thomaz in paintings categories such as Landscape Paintings, Surrealist Paintings and Mixed Media Paintings. Enjoy exploring these sections for other Novica treasures.